Our Single Post Special Needs Swingset Structure brings simplicity and sturdiness to your playground or backyard. 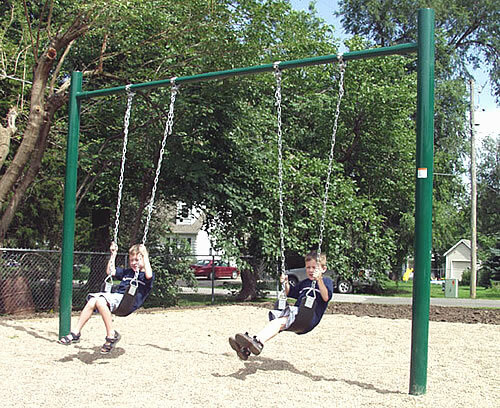 The vertical posts are 4.5″ (outer-diameter), so this swingset can handle even large children and adult users. The Single Post Swing comes in models with 2 seats, 4 seats, 6 seats, or 8 seats (the photos shown here are of a 2-seat model). Note: The flexible belt seats that come with this unit are not considered ADA accessible. You may substitute in special needs seats (please phone us for final pricing). † Note: This is not intended as a guarantee, nor do we recommend that adults use the Single Post Swing as a general practice. Rather, it is offered as an observation about our experience with this item, in response to questions we have received from customers. Interested in the 4.5″ O.D. Single Post Swing? Contact us below for special offers, product information, and pricing estimates on buying special needs playground equipment! To fill out an estimate request, just click here. We sell a full line of commercial-grade play equipment for special needs kids. Check out our wide variety of equipment on the website. If you see an item you like, just phone us toll free at (877) 840-0707, or fill out the contact form on the right-hand side of this page, or fill out a detailed Estimate Request.